Diana Behl is an artist and educator based in Brookings, SD. She holds an MFA and MA in Printmaking from The University of Iowa, a BFA in Two-Dimensional and Design Studies from Bowling Green State University, and is an Associate Professor in the School of Design at South Dakota State University. 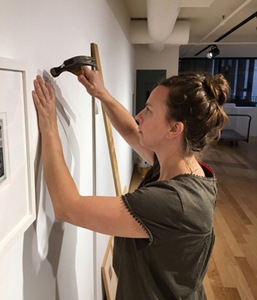 Behl has received grants from the Bush and Griffith Foundations and the South Dakota Arts Council to support her artistic and teaching practices, which are rooted in traditional and expanded printmaking processes and works on paper. Solo and two-person exhibits have been at the Greenleaf Gallery at Whittier College (Whittier, CA), Kimmel Harding Nelson Center for the Arts (Nebraska City, NE), Edward J. & Helen Jane Morrison Gallery at the University of Minnesota, Morris (Morris, MN), and the South Dakota Art Museum (Brookings, SD). Recent group exhibits include The 2017 Boston Printmakers North American Print Biennial at Lesley University (Cambridge, MA), Small Works at Trestle Gallery (Brooklyn, NY), and The Contemporary Print at Flatbed Press (Austin, TX). Her works on paper have been featured in New American Paintings, "New Editions" in Art in Print, as well as in artist-run publications such as Maake Magazine and Printeresting's MANUAL.